A pilot program will be set up to promote reform of the high school entrance exam, according to a guideline issued by the Ministry of Education (MOE) on Tuesday. High schools should recruit students based on both their exam scores and a comprehensive assessment of their qualities, according to the pilot program, which will first be implemented in 2017 and then be expanded across the nation in 2020. 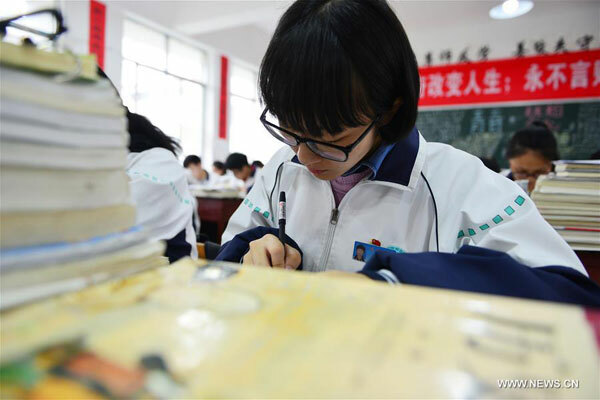 For years, China's education system has been criticized for its exam-driven curriculum, which focuses on memorizing textbooks and getting good test scores. Zheng Fuzhi, a director with the basic education division of the MOE, said that high school enrollment will not only depend on exam scores, but also students' morality, mental and physical health, artistic tastes and social skills. The exam will also reduce the focus on memorizing facts and emphasize analytical and problem-solving skills instead to encourage students to innovate, said Zheng. The reform will also require students to participate more in sports as physical education scores will be considered in enrollment, Zheng added. Zhang Zhiyong, deputy director of the Shandong Provincial Education Department, said that the reform will provide diverse roads and fairer opportunities for students to succeed.